Home » Other » Tequila and margaritas … oh my! Tequila and margaritas … oh my! So I don’t ALWAYS drink beer. A few months back, I went to a tequila tasting at my favorite bar. Whoa! I sure learned more about tequila than I ever thought I would! Did you know not all tequila burns when you drink it? That was news to me. And that bottom shelf stuff they throw in cheap margaritas? You can keep it. Life is too short to drink cheap liquor. Tequila is a blue agave-based spirit made primarily in the area surrounding the city of Tequila, 40 miles northwest of Guadalajara, and in the highlands (Los Altos) of the western Mexican state of Jalisco. Mexican laws state that tequila can be produced only in the state of Jalisco and limited regions in the states of Guanajuato, Michoacán, Nayarit, and Tamaulipas. Mexico has claimed the exclusive international right to the word “tequila”, threatening legal actions against manufacturers in other countries. So that means tequila which does not come from here is not considered a true tequila – much like how Champagne has to come from the Champagne region of France. Tequila is most often made at a 38-40% alcohol content (76-80 proof), but can be produced between 35-55% alcohol content (70-110 proof). Though most tequilas are 80 proof, many distillers will distill to 100 proof and then dilute it with water to reduce its harshness. Some of the more well respected brands distill the alcohol to 80 proof without using additional water as a diluent. There are two basic categories of tequila: mixtos and 100% agave. Mixtos use no less than 51% agave, with other sugars making up the remainder. Mixtos use both glucose and fructose sugars. Añejo (“aged” or “vintage”): aged a minimum of one year, but less than three years in oak barrels. Extra Añejo (“extra aged” or “ultra aged”): aged a minimum of three years in oak barrels. This category was established in March 2006. At the tasting, we were able to sample 4 tequilas and 4 beers. I loved all the beers (of course), but didn’t fancy every one of the tequilas. I learned that I am not a fan of silver tequilas or the gold tequilas. Not surprising since they are the cheapest and haven’t been aged at all (At least I know I’m a snob?). 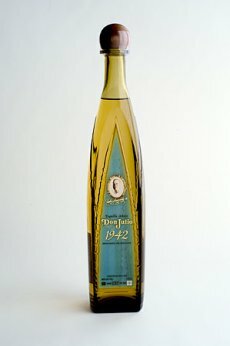 My favorite one was called Don Julio 1942 Tequila Anejo, which is aged for more than 2 years in oak barrels. It has a pure golden color and you can smell the vanilla, apple and oak. It was very easy to drink and had a great sweet vanilla finish. It goes for more than $100 a bottle so I haven’t purchased it yet. One day. We also tried a silver and a gold that night but they were both too harsh for me to really enjoy. I like a smooth liquor. These were anything but that! The silvers and golds are made to put in margaritas so please don’t ever put this nice, expensive and delicious tequila into a margarita! Last night I played trivia with the Notre Dame of Atlanta Alumni Club and we went to a place which has an extensive tequila list. I should have snapped a photo and posted it, but I forgot. Looks like I’ll just HAVE to go back to get that … I ordered a Sinless Margarita – it’s a mix which has only 5 calories. Then you add the tequila and it’s about 100 calories, but that’s MUCH better than the hundreds you can consume with a regular one! It was a nice treat and a change of pace from beer (I’ve had everything offered on their beer menu). If you can find the mix at a store or restaurant around you, I recommend it. It tasted like regular mix without as much pure sweetness. I would never have known it was sinless if I hadn’t ordered it myself. Oh and as a side note, we were robbed of our first place victory by one point because I didn’t know Justin Bieber posted a YouTube video that surpassed Lady Gaga’s as the most watched video on YouTube. I don’t even know what that kid looks like or what his music is and he kept me from winning the club $50 to use towards our check next time (we won $25 – not too shabby)! We only missed 3 questions and this was one of them. Next time, I want to get every question correct. We were so close last night. Hope you enjoyed my tequila round-up. What is your favorite? Do you drink tequila or margaritas? Til next time … Cheers! Preparing for Greece – Opa! Ouzo! If you check out the Good Easts episode on margaritas (with uber-awesome chef Alton brown), he does a great job of explaining the differences between the types of tequilas (like you cited), and offers the BEST margarita recipe we have come across–and we like our margaritas!